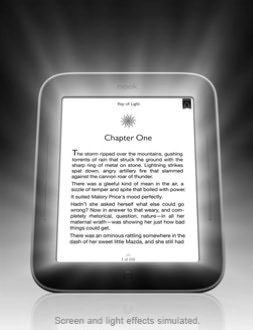 B&N today unveiled a new version of their Nook Simple Touch with GlowLight — an e-Ink based e-reader with a built-in reading light. Designed to appeal to readers who read in bed at night (without wanting to disturb a sleeping spouse), the new Nook uses an LED lighting system hidden around the bezel of the screen. As it’s built into the device and runs off the Nook’s internal rechargeable battery, it’s a superior solution to clip-on nightlights and reading lights. Impressively, the new Nook manages to actually weigh a hair less than the previous Nook Simple Touch, and is still under 7 ounces, which is plenty light enough for easy 1-handed reading. It retains the touchscreen, e-Ink Pearl display, Wi-Fi, and other features of the regular (unlit) Nook Simple Touch, and the light can be turned on or off, for equally easy reading at night or outdoors in bright sunlight. It retails for $139, compared to $99 for the unlit version. It will be available on May 1. While there have been rumors of Amazon coming out with a similar lighted Kindle version (and Sony had an e-reader with a similar, but not as advanced, built-in lighting system several years ago), kudos to Barnes & Noble for beating them to the punch. This seems to be a superior alternative to Amazon’s case with a built-in reading light (which also charges directly from the Kindle’s internal battery). Of note, the reading light will of course reduce the long battery life for which e-Ink e-readers are famous, but B&N says you can still read for a month for half an hour a day with the light on (compared to two months with the light off). I haven’t seen one in person yet, but it seems like a great solution for people who like to read in bed while their spouses sleep. Now, if only B&N would cut back on the overblown hyperbole in their press releases and product descriptions. First of all, you don’t have the “World’s #1 Reader,” sorry, guys. And how they manage to pack “first & only,” “perfect,” “breakthrough,” “optimized,” “revolutionary,” “great,” “exclusive,” “Best-Text,” “fastest,” “most advanced,” “lightest,” “unbeatable,” “best of e-Ink,” and “amazing” all into a few lines of marketing copy is impressive. It’s like playing Superlative Bingo. And their press release is even more over the top. Really, B&N, you make a good product, but when you have to tell me 50x per press release how “most advanced” and “industry-leading” and “most stupendously amazing” and “world’s best in the whole world” your own device is, it just sounds like you’re trying too hard.